For as often as we frequent Kellys East Side located on the corner of Avenue K and 15th Street in old Plano, we’ve never stopped to write about the place! Tim and Carin Kelly, who previously brought you Plano’s wildly successful Taffy’s, invite you to see what the buzz is about on Avenue K, near 15th. Yesterday we took the afternoon off and worked on our own home. There were lots of little maintenance items to do and the yard needed it’s spring cleaning. After 5 hours of laboring, we were both exhausted. 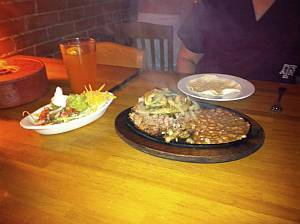 Neither of us felt like cooking, so after a quick shower, it was off to Kellys East Side for a couple of cold beers and brisket fajitas. We’ve had all kinds of fajitas over the years but none of them compare to the brisket fajitas at Kellys. The brisket has been slow-cooked for hours and the setup plates have everything one needs to build a perfect fajita. Wash it all down with one of the 28 different draft beers they serve and you have one tasty Texas meal. The next time you’re in Plano, stop by Kellys East Side!